A growing number of scientists, journalists and policy-makers are speaking out about the increasing environmental damage being done by the livestock industry and the urgent need for radical changes to farming policy. The numbers of vegetarians and vegans are increasing exponentially, especially among young adults concerned about their health, animal welfare and the environment. Now more than ever meat is under the spotlight and the heat is rising. It’s a complex problem and opinions vary widely, with some people advocating that when done right, organic livestock farming can be beneficial to the environment. One thing is certain, writes Owen Day, protecting the status quo will not help our planet – or our farmers. In the past 50 years, global meat production has increased nearly fivefold and average consumption per capita has nearly doubled from around 23kg to 43kg per year. In the UK we eat about 50kg of meat per person per year [3, 6, 7]. To satisfy the huge demand for meat, the area used for grazing and animal feed production now makes up about 80% of the planet’s agricultural land – even though meat provides only 18% of our calories . The global trade in soya – 85% of which is used in animal feeds – is one of the largest international commodity flows and a major cause of deforestation in the Amazon. Livestock production is now responsible for about 18% of all man-made emissions of greenhouse gases , with some studies suggesting a much higher figure . Methane produced by cows is a major contributor, but so too are the emissions associated with fertilizers, soil degradation, deforestation, animal waste and transport. Intensive livestock production is simply out of balance with nature. Farming used to be about integrating crops and livestock so that nutrients were recycled and soil fertility maintained. In the 20th century, most organic mixed-farms were replaced by larger and more intensive farms where inorganic fertilisers replaced manure, and grain-based feeds replaced grass. The age-old nutrient cycle was broken. The huge quantities of fertilizers and slurry involved at “each end” of the intensive livestock industry are too great for the surrounding soils to absorb and end up in rivers and coastal areas often creating anoxic dead zones like the one in the Baltic Sea. European policy-makers are waking up to the need to address this issue. 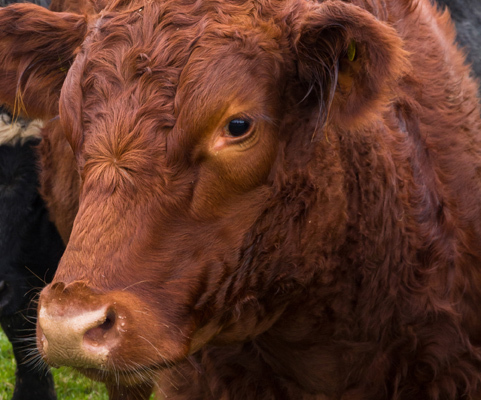 A few months ago, the Dutch Council for the Environment and Infrastructure – a primary strategic advisory board for the Dutch Government – highlighted the importance of drastically cutting livestock numbers to fight climate change and suggested that the government consider taxing meat to reduce consumption. Unthinkable a few years ago. In early September, at the launch of a report  on Europe’s “off balance” animal farming sector by the respected RISE Foundation, the EU’s former environment commissioner Janez Potocnik said: “Unless policymakers face up to this now, livestock farmers will pay the price of their inactivity. Protecting the status quo is providing a disservice to the sector.” Our own DEFRA is also proposing a post-Brexit farming policy that will promote public goods, with an emphasis on soil conservation, wildlife, watershed management and public access. Films like the influential “Cowspiracy” and “What the Health” have played a big part in highlighting the harm being done by industrial livestock farming and the disturbing power of the American meat lobby in influencing food policy. These films also provide a compelling case for the health benefits of opting for a plant-based diet, which is now the fastest growing lifestyle movement in the western world, with 2% of Americans identifying as vegetarians . In the UK, there are 1.2 million vegetarians and the number of vegans increased from 150,000 in 2006 to 542,000 in 2016 – importantly almost half were in the 15-34 age range . Forget the disgusting vat of grey lentils that the Neil the hippy was always stirring (for those old enough to remember the Young Ones), vegetarian food is healthy, satisfying and delicious. Many people are becoming what is called “flexitarian” and opting for predominantly plant-based food with the occasional fish or meat. In his book Meat: A Benign Extravagance Dorset-based author, farmer and ecologist Simon Fairlie examines in great detail the pros and cons of eating meat and explains the harm that removing livestock completely would do to rural communities. He explains that livestock are needed not only to maintain soil fertility but because they are an effective way of converting vegetable waste and grass from marginal land into valuable meat and milk. Keeping a few pigs and cows is also a “safety net” for when times are hard, a sort of living “piggy bank”. Livestock also provide important flexibility in farm management, for instance by allowing excess unsold grain to be fed to animals after a good harvest. His overall recommendation for more sustainable and prosperous rural communities is to halve our meat consumption and keep livestock on smaller mixed-farms with organic permaculture systems. Many small farmers in the UK are turning to agro-ecological grazing methods, like mob-grazing, that have been shown to regenerate soil fertility, increase soil carbon and increase profits . Isabella Tree in her inspirational book “Wilding” also highlights the importance of having some livestock because of the benefits they provide to soils and wildlife. Keeping low densities of free-ranging cows, pigs, deer and horses – all mixed together as part of a rewilding project on the Knepp Castle Estate – not only produces essential income from excellent meat (the horses are not eaten) but has also dramatically increases soil fertility, biodiversity and the return of endangered species, including turtle doves, nightingales and purple emperor butterflies. Interestingly, it is the natural grazing, browsing and rooting behaviour of the free-roaming livestock that create a shifting mosaic of grasses, shrubs and trees, where fungi, insects, birds and mammals thrive. The amount of meat produced per acre may be low, but the costs are also very low, with no inputs of feed, energy, fertilizer or chemicals – and most importantly for the soil, no antibiotics or worming pills. The rate of ecological recovery and the public services that have been created at Knepp Castle – formerly an intensive arable farm struggling with heavy clay soils – are truly astounding and need to be replicated elsewhere. Some people may think it is idealistic and naïve to imagine that we could return to organic and low-density methods of meat production – but they might change their mind if the environmental and social cost of intensive livestock was actually accounted for. If we reduced our meat intake by half or two-thirds or even more, there would be huge areas of farmland available for innovative farming projects that could protect wildlife, improve soils, restore water catchments, absorb carbon, lift our spirits and also produce healthy food. Large “semi-rewilding” projects (true rewilding requires top predators like wolves that are not allowed in UK) could be converted back to arable land after 15 years or so, as part of a long-term rotation system designed to maintain soils and wildlife. Other entrepreneurial farmers are growing “protein” crops for the expanding vegetarian and foodie markets. Quinoa – the ‘superfood’ from South America – is now being grown by a company in Shropshire who are having difficulty keeping up with demand. Quinoa contains twice the protein of rice and barley and is high in calcium, magnesium, vitamin E, several B vitamins and fibre. The United Nations declared 2013 to be ‘International Quinoa Year’ to highlight its nutritional benefits . A study by Exeter University found the climate is now suitable to grow quinoa and other exotic crops like Japanese persimmon, which “tend to be more profitable than more traditional forms of agriculture, … like dairy farming.” In 2017, the UK’s first commercial crops of lentils were grown on farms in Hertfordshire, Hampshire, Suffolk, Sussex and Wiltshire . The trail-blazing food business Hodmedod, a Suffolk-based pioneer of British-grown pulses and grains, is on a mission to reintroduce more British-grown beans, peas and pulses to our diet. One food innovation that is causing a lot of media attention is synthetic meat. While the high-tech companies behind them are clearly doing clever stuff with fake blood and have attracted a lot of investors, there is something clearly unwholesome about this approach. Not only is the process energy and nutrient intensive, but it would also concentrate meat production in the hands of a few large companies, creating yet more wealth inequality and corporate meddling with our food. A simpler and more wholesome way forwards is suggested by the Food Foundation in its recent report “Farming for Five a Day” where they propose a number of interesting policy measures for the forthcoming post-Brexit Agricultural Bill. They highlight the shocking statistic that our fruit and veg consumption needs to increase by a staggering 64% to be in line with the Government’s dietary guidelines. This figure is even higher in low-income households and – even more shockingly – among children. Their most important recommendation is to boost British horticulture. Fruit and veg have the biggest trade deficit of all our food and this is likely to be affected by any new trading arrangements resulting from Brexit. Thirty years ago, 83% of the veg we ate came from the UK – now it is 54%. If the government invested substantially in British horticulture and funded big campaigns to eat more fruit and veg, it would create hundreds of thousands of rural jobs and stem the growing epidemic of chronic diseases like diabetes, cancer, heart disease, which are crippling the NHS. Surely a win-win-win for health, farming and the environment! A future with fewer and happier farm animals, more fruit and veg, and more land for nature and wildlife is not an idealistic dream, but a vision that we can and must create. Food, including small amounts of meat, can once again become a celebration of the things that really matter – community, health, nature, compassion and even our wonderful planet. Owen Day, PhD. is a marine scientist specialised in ecosystem-based adaptation to climate change. H. C. J. Godfray et al., Meat consumption, health, and the environment. Science 361, eaam5324 (2018).